Yesterday, Christie’s diamond and jewelry auction in New York brought some excitement and optimism to many for a few reasons. First, the day ended up with $45,657,125 in sales compared to $35,238,100 at the same auction last year, which shows a strong 30% increase (29.57% to be exact). This indicates that buyers and investors are optimistic about the jewelry industry as a whole, and the value that they see in unique pieces holding their wealth. Second, the top 4 out of 5 lots – and better still – 5 of the top 10 lots, were fancy color diamonds and jewelry. The other 5 items in the top 10 were 3 colorless diamonds, a sapphire and an emerald. Let’s note 11th and 12th place in the auction were also fancy color diamonds. The 5 fancy color diamond lots of the top 10 represent $20,590,000 in sales, or 45% from total sales of the auction. This is an incredible percentage, and further proof of how important fancy color diamonds are for the industry as a whole in terms of monetary value, even though they are a fraction of the supply available in quantity. 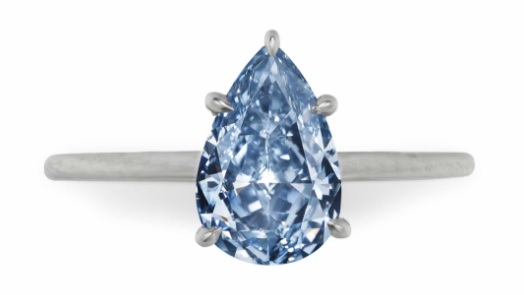 The top lot that was sold at the auction was a 3.09 carat Fancy Intense Blue Diamond with VS1 clarity. It sold for $5,375,000 total ($4.5 million prior to fees), or $1,739,482 per carat, after being assessed at $2 million – $3 million. 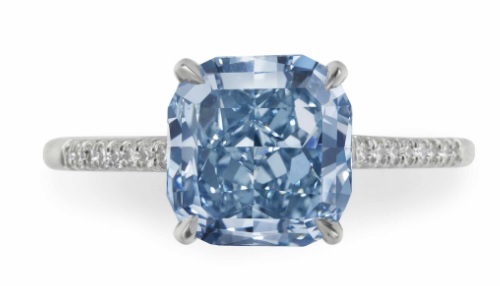 This price represents a new world record for the 3-5 carat weight sub-category for Fancy Intense Blue diamonds. 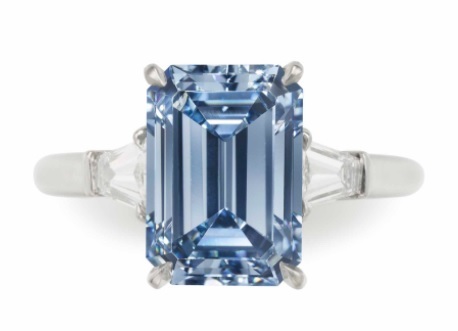 The previous record was $1,530,625 per carat that was broken on April 4, 2017 in a Sotheby’s Hong Kong auction by a 3.13 carat Fancy Intense Blue diamond with an Internally Flawless clarity. The price level for the diamond, and its price well beyond its high estimate, may also indicate that the diamond has the potential to be re-polished into a Fancy Vivid Blue diamond if done carefully by a professional polisher. This is a higher color grade and it would add significant value to the diamond. Re-polishing is only undertaken when the owner is completely sure that the re-polish will be done carefully and successfully, and only when there is real potential for a color upgrade. Not all re-polishes will always result in a higher color grade. The second highest prices lot was an 8.42 carat Fancy Intense Pink diamond with VVS1 clarity. 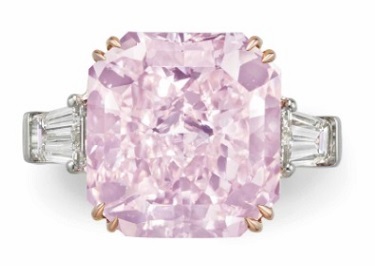 It was sold for $5,037,500 total, or $598,278 per carat. It was estimated to be sold for between $4 million – $6 million. The price reflects the strength of the color in the diamond. Although it was graded as a Fancy Intense Pink diamond, the price per carat that it earned reflects a strong Fancy Pink color of this size and clarity, rather than that of its official color grade, Fancy Intense Pink, which is a higher color grade and would earn even more per carat. This further demonstrates how in fancy color diamonds an investor must use a professional who understands and knows fancy color diamonds in order to determine a diamond’s true worth. This helps investors avoid overpaying for a diamond. The next highest selling lot was a duo ring containing a 2.85 carat Fancy Intense Pink I1 diamond and a 2.42 carat Fancy Vivid Blue VS2 diamond. It was sold for $4,512,500 total, or $856,261 per carat on average for both diamonds. It is clear and obvious where the majority of the value is. It was estimated to sell between $3 million – $5 million. 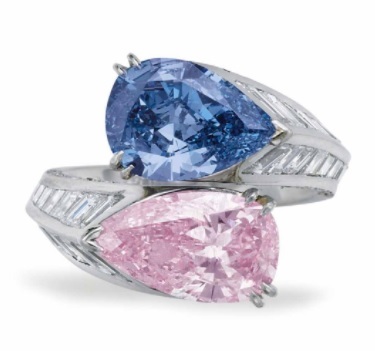 Although there would be differences of opinion as to the exact value divided between the pink diamond and the blue diamond, the blue diamond’s value represents a new world record in the 3-5 carat weight Fancy Vivid Blue sub-category when it comes to the total value paid for a diamond, and makes it the second record set for the evening. The next most expensive item sold was also a duo diamond ring, one with a 2.10 carat Fancy Vivid Blue VS1 diamond and a 1.98 carat D color VS1 diamond. It sold for $3,492,500 after being assessed at $2.5 million – $3.5 million total. 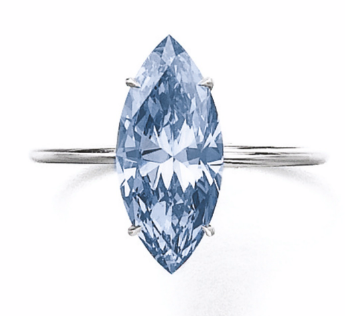 Here it is obvious that over 97% of value was in the Fancy Vivid Blue diamond. The per carat sale price was $1.66 million per carat, which is the third world record for the evening. This is a record price for the sub category of 1-3 carat weight Fancy Vivid Blue diamonds. The previous record was at $1.25 million per carat that was paid for a 2.31 carat Fancy Vivid Blue SI2 diamond on November 16, 2016 in Geneva. A 2.81 carat, Fancy Intense Blue Diamond with VVS1 clarity was sold for $2,172,500 or $773k per carat. This is not a record breaking price, but it sure is a strong price. 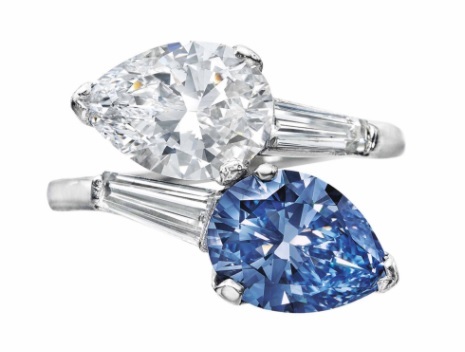 The 1.27 carat Fancy Intense Blue VS1 diamond sold for $696,500 or $548,425 per carat. It was estimated to see between $100k to $150k or $78.7k to $118k per carat. Obviously, the auction house got it completely wrong. We already knew that the estimates were off, as we stated in our article summing up the auction prior to its beginning. Between optimism in the market and several new sub records, it seems after a deeper analysis that this year looks very promising for fancy color diamonds. Some skeptics may not see the true potential, but if we pinpoint the profitable situations, we will see a different picture at the end of the year. Like always, we have to be careful with our investing dollars, and not just buy anything that seems to have a potential. Just like in any alternative asset, it is important to invest in items that are rare, unique, and which over time will be easier to sell. When you are equipped with true, honest and correct information, an investment in this type of asset can be very successful. Got any questions about the new broken records in blue diamonds, about diamond auctions, or about investing in diamonds? Ask us in the comments! 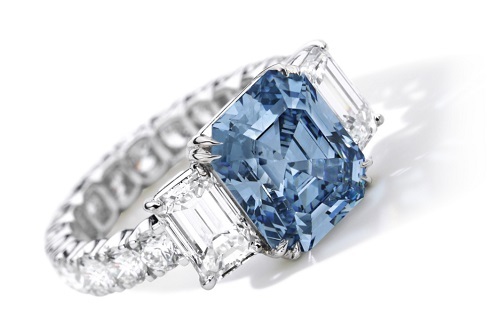 Blue Diamond Price Record Broken By Sotheby’s Held For A Single Day!